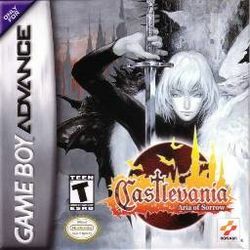 Today we’re skipping ahead a few years to look at “Aria of Sorrow,” the last of the ‘Metrovania’-style Castlevania games for the Game Boy Advance. This means that rather than consisting of numbered platforming stages that the player must complete in order, the game is instead one large 2-D map, with the player gaining access to new areas through the use of special abilities. For example, once the player gets the ability jump in mid-air, they can reach higher platforms and thus reach corridors they couldn’t previously. 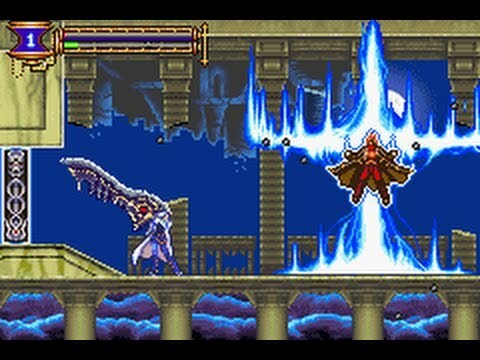 In the Castlevania series, this format started properly in Symphony of the Night for the Sega Saturn and Sony Playstaion. Aria of Sorrow breaks with tradition in that rather than being set in the middle ages or 19th Century, this game takes place in the future. The game is set in 2035, but the future date doesn’t play much into it, except that you can score a sweet laser rifle later in the game. But at that point, your other options include powerful holy weapons, so it’s not really an upgrade. No cybernetic werewolves or anything. The main character is Soma Cruz, an American teenager living in Japan. When he goes to watch a solar eclipse at a shrine operated by a childhood friend, he passes out. When he wakes up, he finds himself in Dracula’s Castle, and in possession of inexplicable power. As Soma makes his way through the castle in search of answers, he meets sinister missionaries, amnesiac exorcists, and other mysterious people. Aria of Sorrow pushes the GBA to its limit with absolutely gorgeous graphics and a sprawling castle filled with monsters. Soma’s powers are a neat twist of the Castlevania formula, and encourage exploration in search of new souls to win and try out. It would be nice if they weren’t quite so rare, and packed a bit more of a punch, though. Especially early in the game, they don’t have the same heft to them as the classic subweapons. While this does give a sense of progress to the game as the player collects stronger and stronger abilities, it can be a grind to collect them. Overall, “Aria of Sorrow” is a definite hit in the Castlevania score sheet, and not to be missed. If you can’t find a used copy of the cartridge, it is also available as a download from the WiiU store. If you enjoyed this article, please share it, or support me on Patreon for early and exclusive podcasts and articles. October is Dracula Season here in the Hugh Likes… HQ, and for my money there is no better modern representation of the character than the Castlevania franchise. The original, produced by Konami in 1987, is a classic example of the old-school challenge of the NES. Tough but never entirely unfair, the player controls Simon Belmont as he fights his way through Dracula’s castle to his showdown with the King of Vampire himself. The original game has a fun, almost campy sense of atmosphere as Belmont fights his way through a laundry list of B-movie monsters. Famously difficult, the game really conveys the feeling of the environment itself as an adversary. This is a difficult balance to achieve, because it can more often feel like the player is fighting the programmers rather than the game. Like Nintendo’s flagship Super Mario Bros, Castlevania is a sprawling environment that relies on careful exploration, precise timing, and sharp reflexes. Belmont is armed with an upgradable whip and a variety of subweapons that he finds in the castle. While blindly rushing ahead and collecting every subweapon as it drops can result in a series of deaths, a careful strategy, admittedly formed through trial and error, guides the player through each level. A very generous continue system for the time lets the player keep trying for as long as they like. With the sad news that Konami is scaling back its production to focus on the mobile phone market, we may not see anything new from the series for a while. What better time to dust of a control pad and take your journey through Dracula’s Castle? 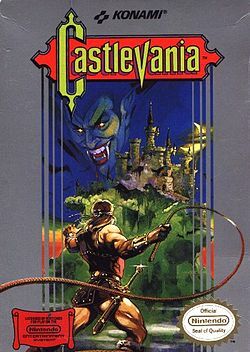 Castlevania was originally released for the Nintendo Entertainment System as well as other 8-bit consoles and arcades. It is also available digitally for the Nintendo Virtual Console on Wii, Wii U, and 3DS. Enjoy Hugh Likes Video Games? Please consider joining my Patreon for more content! In honor of this dark and terrible holiday, I’m writing a bit about one of my favorite games, recently re-released. “Castlevania: Circle of the Moon” was a launch title for the Game Boy Advance. Although well received, it quickly came and went into relative obscurity as later installments in the series came out for the GBA and later Nintendo DS. But it’s still a classic in my book. Considered a side-story at best, the game’s protagonist is Nathan Graves, an earnest young man in possession of Vampire Killer, the famous Dracula-slaying weapon of the Belmont clan, whose noticeable absence is never actually addressed. He’s out to stop the Vampire Carmilla from resurrecting Dracula and killing his mentor. Like most of the franchise, the actual story is mostly just an excuse to show you the castle, and this is a good one. Like Symphony of the Night, this is a sprawling open castle which grants you access to new areas as you gain abilities. While it is a bit smaller than the Playstation’s sprawling ruin, there is a nice variety and scope to the castle, which is perfect for a portable adventure. The gameplay is fun and feels nicely balanced. Nathan has a neat ability to twirl the whip like a shield and block some projectiles. He also has the DSS Cards. These cards, which you collect throughout the castle from certain enemies, act as the game’s magic system. Each effect and element card grants a different ability, giving you one hundred different ones, if you collect them all. These range from shooting fire balls to summoning angels to directly increasing your stats. These abilities are my favorite aspect of the game. Not everything about the game has aged gracefully, however. The sound in particular has a low-res, monophonic quality that doesn’t do justice to the classic Castlevania music. As a launch title for the GBA, the color palate for the game is a bit dark and muddy. While this is thematically appropriate for the ruin of a European castle, it made the game difficult to see, particularly on the original screen, which was not backlit. More modern devices such as the DS and Wii U tablet handle the display better, but it was a clear step backwards from Symphony of the Night’s beautiful sprites and backgrounds. Castlevania: Circle of the Moon is available as a GBA Cartridge (amazon,) or digitally from the Wii U store.